Having planned a week-long trip across northern Morocco for this year’s Semana Santa (Holy Week) Easter vacation, I next had to figure out how I would actually get there from southern Spain. Some people recommended flying, but that seemed impractical given the circuit I would be making. Another option was taking a ferry—a boat designed for *ahem* ferrying cars across bodies of water but that also carries people—from Spain’s Mediterranean coast to the coast of North Africa. Ticket prices were reasonable, and there was even an overnight option to get to the eastern side of the country. 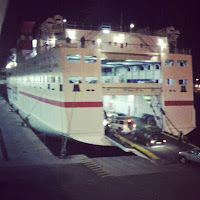 So I bought a seat on the night ferry from Almería, Spain to Morocco Melilla, Spain—but more on this geographic oddity in a forthcoming post. 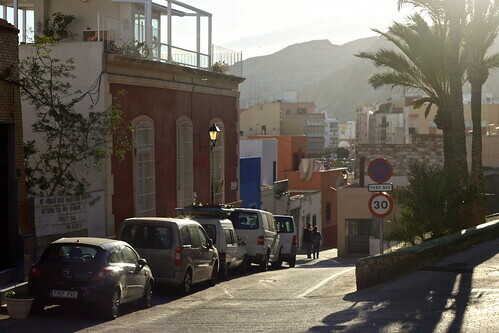 To make a long, missing-the-train, getting-pissed-off-at-the-bus-company story short, I was left with a half-day layover in the city of Almería, a provincial capital on the Mediterranean coast a few hours southeast of Granada. Spending the afternoon and evening in this little-visited (albeit isolated) place was the best way to start off a week of go-go-go travel. 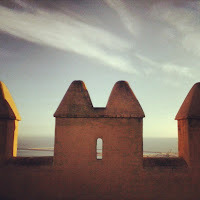 Most people have never even heard of Almería, but after visiting I realized it’s one of Andalucía’s best-kept secrets. Here are seven things you can do to experience this really cool city. After hopping off the train at the end of the line, I wandered across the sunny, breezy old town in search of one of Almería’s teterías, or Moorish-style tea houses common in southern Spain serving all flavors and combinations of teas and decorated in gaudy designs that are often a caricature of Morocco. Friends had told me good things about Tetería Almedina, and my high hopes were met when I came for lunch. I ordered a cuscús dulce de pollo (sweet chicken couscous), a flavor explosion of almonds, dried fruit, juicy chicken, and light, savory couscous grains. To finish things off I got some Moroccan tea (green tea brewed with fresh spearmint leaves and lots of sugar) as well as some pastelitos árabes (“tiny Arab desserts”). It was a great introduction to Moroccan cuisine before getting it non-stop the next week. 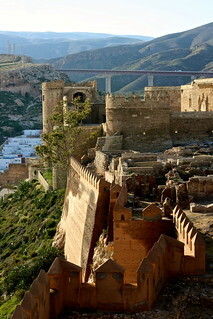 I was most looking forward to visiting Almería so I could crawl around its local alcazaba, or Moorish-style castle. I’m never one to turn down a castle if there’s one somewhere I’m touring, so, naturally, I couldn’t resist Almería’s. But what made it so interesting, in contrast to other castle ruins elsewhere in Andalucía, was the sheer size of the thing and the consistency in design. The whole complex sits on a long, towering hill and has a series of castle grounds varying from ruins to Christian-era palaces. 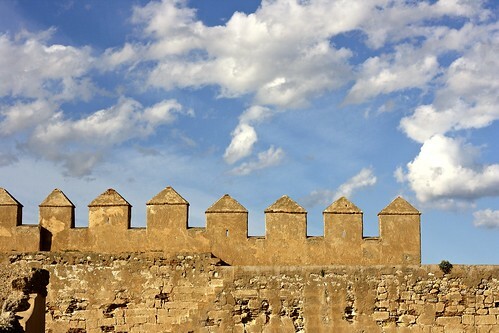 I really loved the alcazaba’s endless repeating merlons, or pointy bits that cap the parapets on a defensive wall. From the castle you get to take in the city rolling to the southeast, the rugged mountains to the north, and the Mediterranean Sea to the south. An an amateur photographer (if I do say so myself), I got really excited when I read in the guidebook that there was an “Andalusian Photography Center” in town. Two floors of exposition galleries, instructional classrooms, and a gift shop comprise the center, which is housed in a remodeled lyceum or old secondary school. The exhibition on display when I was there showcased the works of Spanish photographer Gervasio Sánchez, who has spent decades photographing war zones in the Balkans, sub-Saharan Africa, and Central America. Very, very moving pictures that didn’t try to soften the reality that war is hell, but that also showed the hope that recovery and healing is possible. As a big history nerd, of course I’ll go to an archaeology museum if there’s one in the city. My experience in Almería was no different. Although the museum’s exhibits focus mainly on the prehistoric peoples that lived across the province—the Los Millares El Argar groups—there were also a few rooms about the Romans and the Moors, as per usual. It’s so funny that basically every province in Spain has some sort of collection of Roman artifacts, like it’s no big deal at all. Crazy! One of the most interesting exhibits is a massive wall of dirt, displayed like a cross-section of time where you can see the different layers or strata that represent the Neolithic peoples, the Phoenicians, etc. all the way up to the present day as you climb the stairs. Back in the days of the Caliphate of Córdoba—the Moorish empire that governed much of Spain and Morocco until the 1,000s CE—Almería a.k.a. al-Mariyyat functioned as the main trading port for the region and prospered for some time. After the Christian conquest (just three years before Granada was taken! 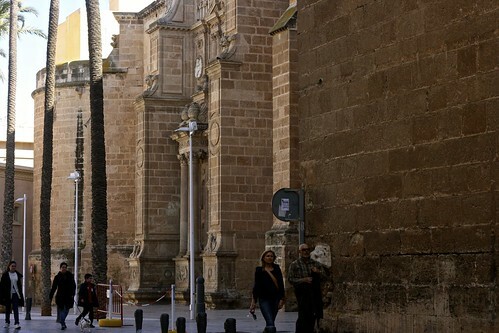 ), Almería began its decline, and at one point had only 400 inhabitants. Bombed in the 20th-century Civil War, the city has since rebounded and today is becoming an important port. From Almería you can catch ferries running to Morocco, Algeria, and (oddly enough) Spain: to Morocco, you can go to Al-Hoceima and Nador; to Algeria, you can go to Ghazaouet and Oran; and another ferry will take you to the Spanish exclave of Melilla, right outside of Nador. Tapas are little two- or three-bite-sized appetizers people get at restaurants in Spain to go with their drink, a fun little custom that encourages creativity and also showcases essential bits of regional cuisines. In most places you have to spend about 2 € for each tapa—which can be anything from a mini sandwich to a small bowl of potato salad. However, in some provinces the old custom of serving tapas gratis with whatever you order to drink still endures, and Almería is one of them! I happened to be there on the last day of the tapas festival, so one of the teterías I went to served me a fancy (and huge) tapa of couscous. 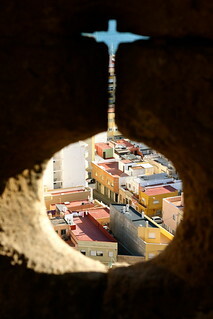 Can you think of any other “best-kept secrets” in Spain or elsewhere? Spill the beans in the discussion below!